The Offwell Valley in East Devon, England. The Woodland Education Centre is situated in the woodland towards the left-hand end of the image. This image gallery gives an impression of the beautiful countryside which surrounds the Woodland Education Centre, near Offwell in rural East Devon, England. Situated about 9 miles from the English Channel coast, the Offwell Valley lies at the head of the larger Axe Valley. Much of this rural area is covered by farmland consisting of small, irregularly shaped green fields. These are interspersed with deciduous, coniferous and mixed woodland. Many of the hedges that separate the fields are hundreds of years old and are an important habitat for wildlife. The Offwell Brook runs through the valley and can be seen in some of the images. The brook feeds water into the important wetland habitats of the Woodland Education Centre, before eventually running into the River Axe which reaches the sea at Axmouth near the town of Seaton, some 9 miles to the south. 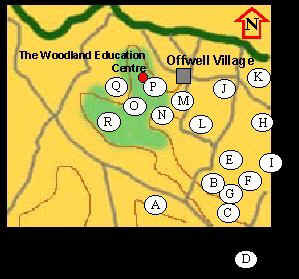 A map below covers most of the Offwell Valley and has a number of locations marked with letters. These letters match with a location name and a representative thumbnail image. Click on the location names to reach a page of other thumbnail images taken from that location. Then click on any of these thumbnail images for a larger version to open in the same window. Please note that although some of the photographs are taken from publicly accessible areas such as footpaths, bridlepaths, field gateways and roadside verges, many of them are taken from private land (with permission). All the information including images, charts, movies and sounds is provided copyright free for educational use, by schools, colleges and universities unless you are making a charge. If you wish to use information or any part of this site for commercial purposes or for any purpose where a charge is made then you must get permission, so make sure you contact us first. Note that company logos are reproduced with permission and remain copyright of their respective owners.